(CNN) -- Their numbers aren't large, but professional athletes are starting to take a more visible role in protesting police violence. The growing outcry comes in the midst of a "week of outrage" over police brutality after recent deaths of unarmed black men in Ferguson, Missouri and New York. The outage peaked twice in recent weeks as grand juries decided not to indict white police officers in the deaths of Michael Brown and Eric Garner. Witnesses said Brown had his hands up when he was shot and killed. In Garner's case, he was put in a chokehold. His final words: "I can't breathe. I can't breathe." Professional athletes joined the demonstrations on November 30 when five St. Louis Rams players made the "hands up, don't shoot" gesture before a game against the Oakland Raiders to remember Brown. The public displays of support have been subtle, poignant and slowly gaining momentum. 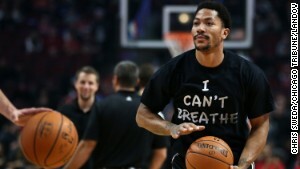 In the NBA, Chicago Bulls point guard Derrick Rose was next to join the cause, quietly wearing an "I can't breathe" T-shirt during warm-ups before Saturday's game against the Golden State Warriors. "I could are less about who else weighs in on this," he said when asked if professional athletes should weigh in on the matter. "Usually athletes tend to stay away from this, but I just felt as if I had to do something it." Bull's head coach Tom Thibodeau backs his player. "He has something to say. I think its a great message," Thibodeau said. "You know its about injustice, equality for everybody." Then on Sunday, it was Detroit Lions running back Reggie Bush with the slogan scrawled across his shirt in black marker. Also on Sunday, Washington defensive lineman Chris Baker echoed the St. Louis "hands up, don't shoot" display after sacking Ram's quarterback Shaun Hill. Baker later confirmed the meaning on his Instagram account with the expression and a string of hashtags. "Hands Up Don't Shoot #BLACKLIVESMATTER #nojustice #RIP #MICHAELBROWN #ERICGARNER #TIME4ACHANGE." The quiet demonstrations rose to a new level Monday night as Cleveland took on Brooklyn in New York. LeBron James and Kyrie Irving of the Cavaliers and four Nets -- Kevin Garnett, Deron Williams, Jarrett Jack and Alan Anderson -- donned "I can't breathe" T-shirts for warm-ups. "Obviously, we know that our society needs to get better," James told Fox Sports Ohio. "Violence is not the answer and retaliation isn't the solution. As a society we know we need to get better, but it's not going to be done in one day. Rome wasn't built in a day." James had already joined the conversation a couple of weeks ago when the St. Louis grand jury announced it's decision. At the time, the NBA all-star posted a drawing on his Instagram account showing Mike Brown and Trayvon Martin walking arm and arm. With the national debate ramping up, it's seems likely professional athletes will continue to keep this ball in play.